Back when your historic home was built, a paint job would typically last 20-25 years. At that time, paint simply consisted of linseed oil and pigment for color. Linseed oil protected the wood and extended the life of the paint job. Once the oils are depleted, a paint job will fail. Because modern paint is made with solvents and less linseed oil, the wood dries out more quickly, causing the paint job to fail more rapidly. Oil is the critical element to insuring a long-lasting paint job. Linseed oil needs to be added back to the wood of a historic home, and to do this, the old paint first needs to be removed completely. Complete paint removal can be achieved most effectively by using a Paint Shaver. 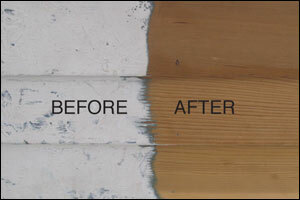 As the name implies, a Paint Shaver uses blades to quickly shave multiple layers of old paint from the wood. The devise is connected to hepa vacuum that safely collects the debris for disposal. Another option is to use heat. Both are EPA approved methods of paint removal. If the proper steps are taken, your new paint job can last much longer than normal - years longer. It's all in the preparation. With a little more work upfront, you will end up with a much more beautiful and longer lasting result. In this area of the country, houses that were built before 1900 usually had cypress clapboards and trim. Those built after 1900 most commonly used redwood. Both are very good for paint. Because cypress grows in swaps, it is less susceptible to rot and insect infestation. Once the wood is free of paint, any damaged wood should be repaired or replaced and all the nails set. At this point, it is ready to be sanded and sprayed with a mixture of linseed oil and mineral spirits. The mineral spirits help draw the linseed oil deeper into the pores of the wood and then evaporates within 24 -48 hours. Next, linseed oil should be added to an oil-based primer to further improve the integrity of your paint job and allow it to last for decades. The final steps of a superior paint job are to caulk and then topcoat with two coats of acrylic paint.